from Family at the Foot of the Cross! My Little Flower made a St. Padre Pio Lapbook. 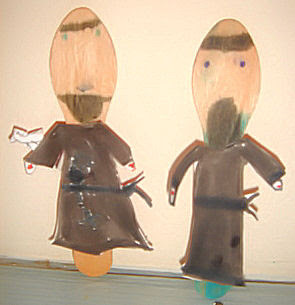 Waltzing Matilda has 2 St. Padre Pio Coloring Sheets! These were colored by Keeper of the Keys. Cottage Blessings. He’s standing with St. Francis here. Okay, so I know that you love them and all, but those stigmata rice krispie treats made me burst out laughing. It is very creative, that's for sure! I too love those stigmata rice krispies. gotta try 'em this year. and thanks for featuring me on your blog today. Charlotte's coloring pages are beautiful. I too want to really celebrate this holy Saint this year. I learned much about him just reading up on him as I was making the lap book. Great finds as always. I love the stigmata rice krispies. So awesome!